Today’s bit of homebrew saw me wind and test a 4:1 Current Balun – The PZT Shack features an aerial connection plate in the wall cavity which includes a couple of 1:1 Choke Baluns – One of these is in full-time use connecting the 300-ohm balanced feeder of my Doublet to the back of my MFJ-948 ATU. But – don’t these tuners already have a 4:1 Balun inside? Yes, many do and the 4mm terminals on the back allow you to connect the balanced-line from your Doublet ready for matching – with this convenience why should anyone want to build an external one? Performance: The amount of turns and the type of core used will determine how good a job the balun does. The wrong core and/or insufficient turns can make things worse. Rating: The type of cores used in the small/medium-price ATUs are typically of the 1.4″ diameter and, conservatively, good for about 150-watts – assuming an ideal match. As our tuner is there to deal with a less-than-ideal match the power handling may drop considerably! Right Tool for the Job: 4:1 Baluns, especially those found inside ATUs and those placed at the feedpoint of an OCFD/Windom are of the voltage type which may cause issues – more so if they have a significant length of coax between them and the radio. After some reading of Steve G3TXQ’s page on tuner balun ratios, I decided to wind myself a “proper” 4:1 Current Balun to see how it compared against my existing 8-turns of RG58 on a single FT240-31 ferrite. Notice how they are wired: 200-ohms becomes 50-ohms by wiring the aerial-side in series and the radio/tuner end in parallel. The aerial is connected to the single red and black wires (the middle wire are left “as-is”). If this was going up in the air as part of an off-centre-fed dipole, the short leg of the dipole would connect to the black wire. The radio/tuner is connected to the pair of red and black wires at the bottom. 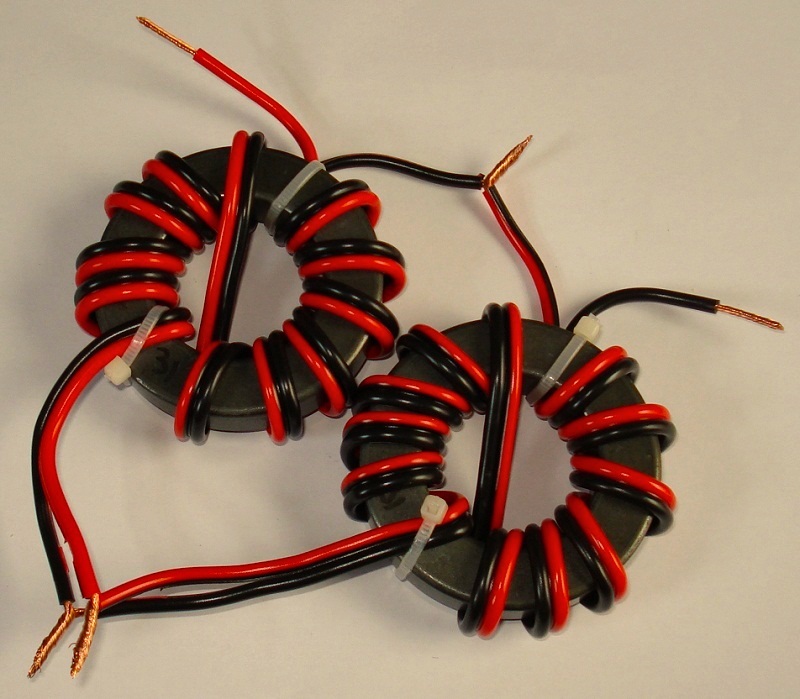 You may see examples online where 4:1 current balun has been built on a single ferrite core – this is poor design! 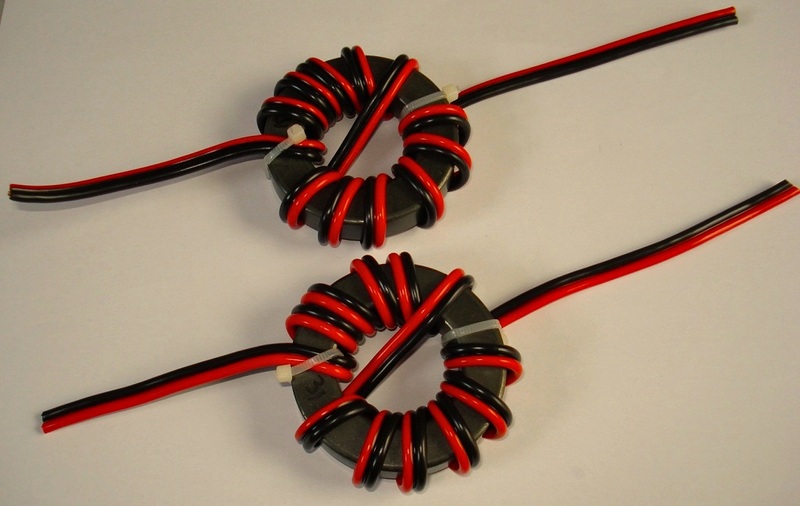 In order for the balun to work effectively, it MUST be wound on 2 separate toroids. Another benefit is that you’ll be able to use thicker wire for increased power capacity. The cable here is 15A automotive/speaker twin. If your requirements are a little more “QRP” then you can wind a lighter version on 2x FT140-43 toroids – certainly good for up to 100w. As expected, I found this 4:1 arrangement to work well on some HF bands but had problems getting a good match on 12+10m. There are a number of factors which affect the performance of a 1:1 vs 4:1 Balun here: Doublet size (I have just under 18m per leg) … Length of feeder (about 18ft here) … Band in use, etc. Have a look at G3TXQ’s page above if you want to explore this in greater depth (with numbers and pretty graphs) – but the broad-strokes are that just because you have 300 or 450 feeder, doesn’t mean that you need a 4:1 balun – in most cases, a 1:1 will be better. It’s worth mentioning that, should your Doublet be close to 50-ohms on a certain band and you’re using a 4:1 balun – you’ll be dropping its impedance down to around 12.5-ohms and tuners have a harder time coping with a low-impedance mis-match than a high one. If you’re looking at putting up a Doublet, then a simple 1:1 Balun/Choke at the ladder-line/coax junction will be fine. If your interests are in the lower (<10MHz) bands, adding more wire to the aerial by snaking them on a set of plastic spreaders will also work well. Below is a diagram of my own 80m Doublet – I’ve managed to get just under 18m of wire each side of the feeder by making use of some clear plastic spreaders – The wire simply “snakes” through them: Out from the centre, back in, and then out to the far end. It’s a great way of getting a low-noise and balanced aerial in the air if your garden isn’t particularly big.